Our first South Bay Puppy Raisers meeting with Jethro was the October meeting — where there is traditionally a Halloween costume contest. We didn’t win this time (I’m 2 for 3! ), but his “Julius Pee-sar” costume was hand-made and pretty fabulous, if I do say so myself. You’ll see that a few posts down the road…. The first part of the meeting is the obedience class, and for tiny puppies, puppy kindergarten. Since there were only a few super-newbies, we just practiced some cradling and talked about basic “It’s adorable and it’s home with me, but now what do I do with this thing” principles. It’s apparently the Great Puppy Glut of 2010 up at GDA; there are lots of new puppies are coming to our group over the next few months, so there were more people without dogs than with. Good instruction beforehand goes a long way, and our area group leaders and co-leaders are terrific about encouraging new puppy raisers. Because I’ve done this before, I made sure Wolf got some time on the floor with our boy so he could learn the proper technique as well. Fortunately, Jethro’s at the age where he’s sleepy much of the time. 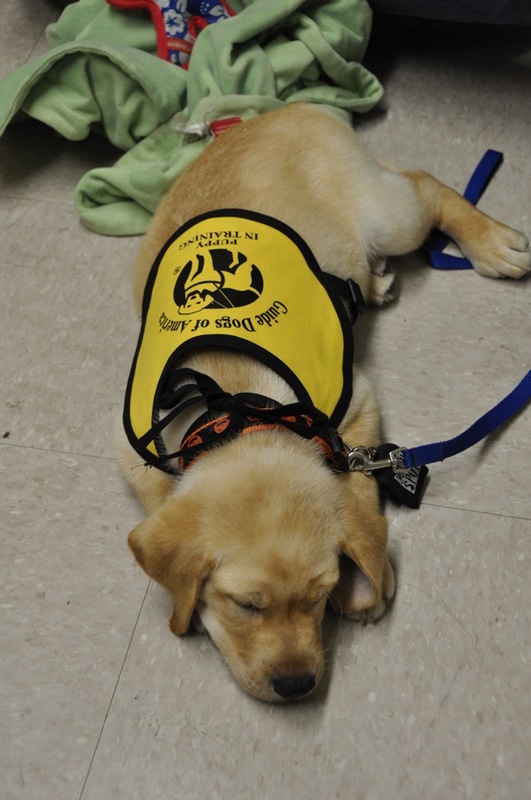 Another bonus is that GDA has started bringing in volunteers to help socialize the puppies in the puppy nursery before they go home with their raisers. This seems to have done wonders for the little ones; Jethro was ready and willing to cradle from day one. Whoever spent time with his litter, THANK YOU!